CitoVac gives the user a superior impregnation which is carried out quickly and efficiently. Perfect for porous materials, such as specimens for failure analysis with cracks, porous casts, and composites, electronic components, rocks minerals, ceramics, and spray coatings. 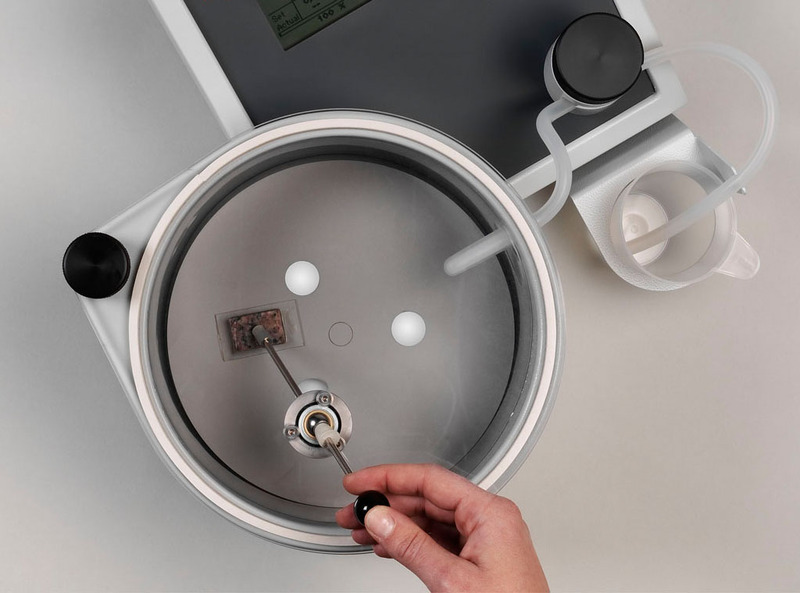 CitoVac is extremely user-friendly, and is equipped with a spacious vacuum chamber. Perfect impregnation of porous specimens requires that there is no air in the pores and cracks of the specimens when the impregnation material is applied. The only way to obtain this is to impregnate under a vacuum. CitoVac ensures a perfect impregnation of the specimens. Just a few touchpad keys make for easy operation. The display shows settings, present vacuum, and time. The display and touch pad are placed behind the chamber to avoid soiling with mounting material. Up to eight specimens can be impregnated simultaneously . 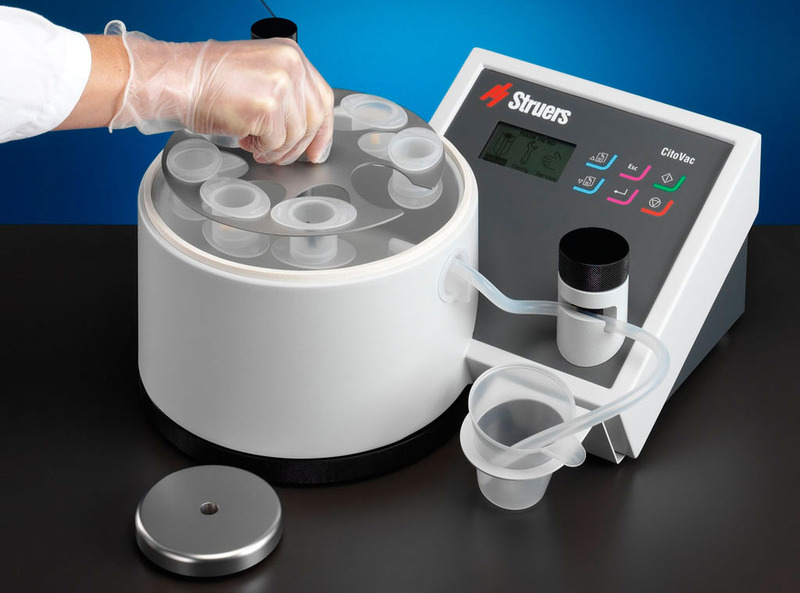 Special mounting cup holders make it fast and easy to handle multiple specimens at the same time without spillage of impregnation material in the vacuum chamber or outside on the cabinet. All parts exposed to contact with mounting materials are disposable in order to minimize cleaning. 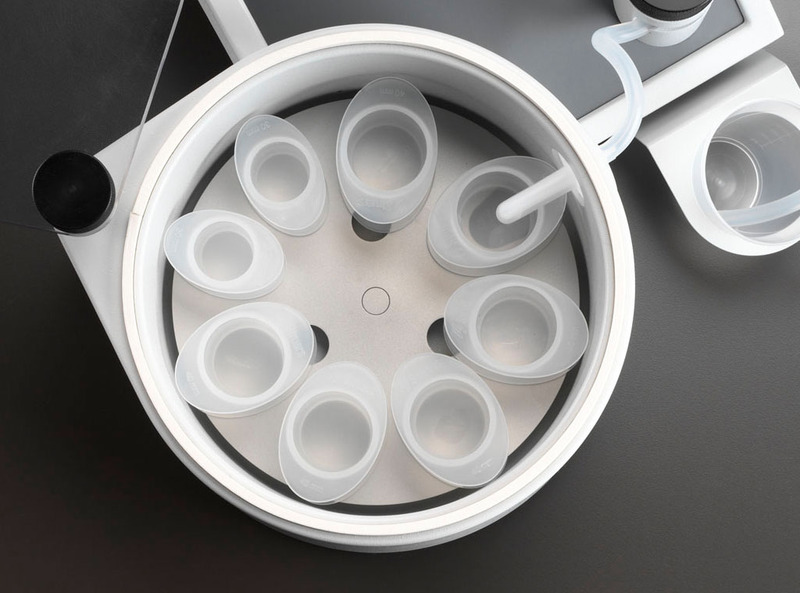 CitoVac is designed for trouble-free filling of the mounting cups without spilling of impregnation material in the vacuum chamber or outside on the cabinet. This is achieved by manually rotating the mounting cups on the turntable to the fixed inlet tube. The valve controlling the flow of the impregnation material is also easy to handle. 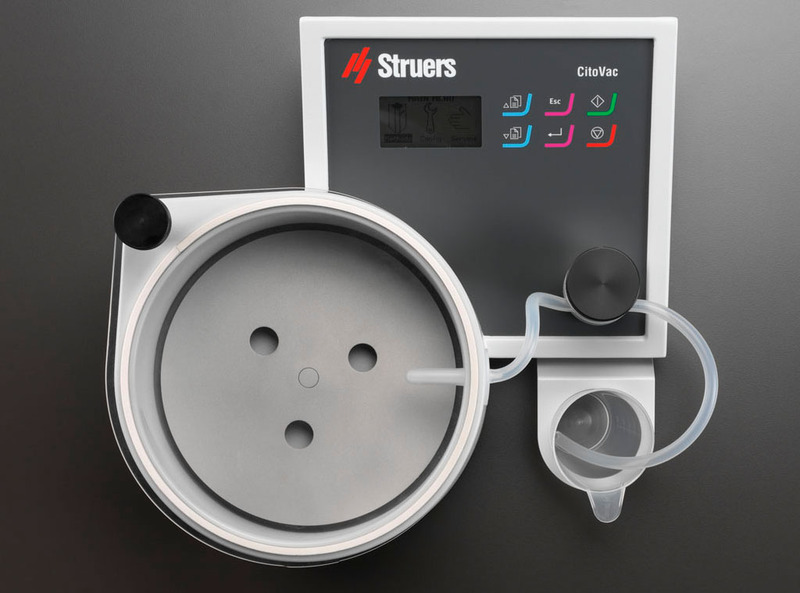 The transparent lid allows a clear view when filling the mounting cups in the vacuum chamber. Therefore, the amount of impregnation material per cup can be controlled, which results in less waste of impregnation material. All consumables in contact with the mounting material are disposable, ensuring optimum user safety and reducing cleaning to a minimum. Many specimens can be impregnated at the same time. Using 30 mm / 1¼" mm diameter mounts, ten specimens can be mounted, using 40 mm / 1½" diameter mounts; eight specimens can be mounted at the same time. In addition, the large vacuum chamber also allows impregnating large specimens under a vacuum. 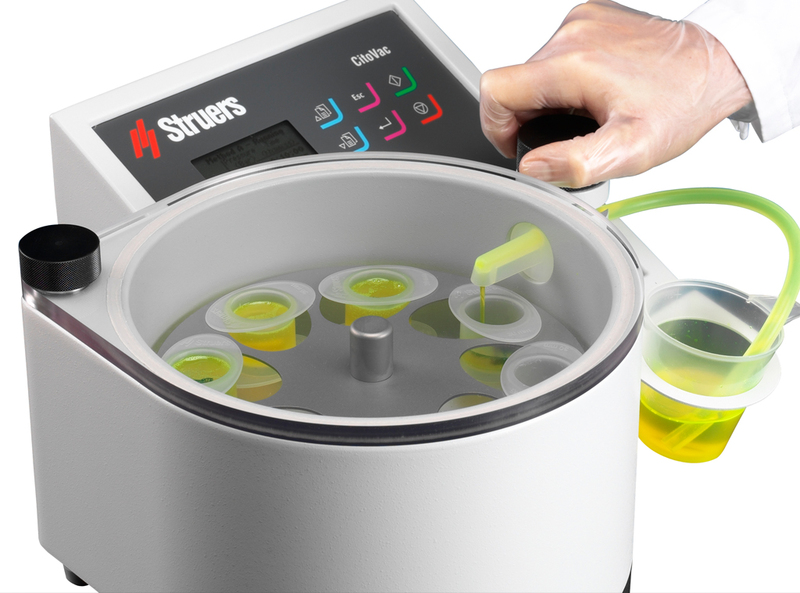 Thus, CitoVac can use a 200 mm / 8" diameter mounting cup to impregnate large samples. CitoVac can be used to glue a specimen onto a glass slide in order to make thin sections. An optional lid with a pressing rod is used for this purpose. A support ring underneath the holder makes sure the holder does not move during gluing. When gluing specimens for thin sections, the specimen is pressed against the glass slide using the pressing rod, which is led through a ball bearing in the lid. This ensures efficient gluing with an even, thin layer of glue and no air bubbles. Vacuum impregnation unit. Compressed air supply 4.5 - 6.0 bar required. 1.0 x 100–240 V / 50-60 Hz. Vacuum impregnation unit. External vacuum pump required. 1.0 x 100–240 V / 50-60 Hz.